What Kind of Shepherds Did the Angels Appear to? It may therefore be regarded as a settled point that, according to the Jewish fathers, Messiah, the Son of David, was to be born in Bethlehem of Judah. But there is one passage in the Mishnah which throws such peculiar light on the Gospel narrative, that it will be best to give it in its entirety. We know that, on the night in which our Saviour was born, the angels’ message came to those who probably alone of all in or near Bethlehem were “keeping watch.” For, close by Bethlehem, on the road to Jerusalem, was a tower, known as Migdal Eder, the “watch-tower of the flock.” For here was the station where shepherds watched their flocks destined for sacrifices in the Temple. So well known was this, that if animals were found as far from Jerusalem as Migdal Eder, and within that circuit on every side, the males were offered as burnt-offerings, the females as peace-offerings. R. Jehudah adds: “If suited for Paschal sacrifices, then they are Paschal sacrifices, provided it be not more than thirty days before the feast” (Shekal. vii. 4; compare also Jer. Kid. ii. 9). It seems of deepest significance, almost like the fulfilment of type, that these shepherds who first heard tidings of the Saviour’s birth, who first listened to angels’ praises, were watching flocks destined to be offered as sacrifices in the Temple. Wow, you could definitely say that has some deep significance! The shepherds the angels appeared to weren’t just any shepherds—they were shepherds who looked after the flocks destined to be sacrificed in the Temple. What a foreshadowing of the ultimate destiny of the baby Jesus: to be the ultimate sacrifice that would atone for sin once and for all. Was Jesus Really Born at an Inn? Luke states that as a result of the census of Quirinius, Joseph returned with Mary, who was with child, to his home city of Bethlehem in Judea (2:3). The Evangelist then notes, “and while they were there” (egeneto de en to einai autous: Εγένετο δε εν το ειναι αυτος) Mary went into labor (v. 4). The statement regarding Jesus’ birth, “And she gave birth to her first-born son and wrapped him in swaddling cloths, and laid him in a manger, because there was no place for them in the inn,” has accrued layers of Christian tradition, in particular, due to the translation of the final word “inn” and a reference to a “manger” (fatne: φάτνη; i.e., an animal trough). Often what is envisioned is a nativity scene that involves a wooden or stone barn that is isolated from family and friends. Understanding the story naturally requires considering how ancient Jews lived in Bethlehem and in other areas of the land of Israel. Excavations have shown that houses in first-century Jewish villages and towns were often built with local stone; for example, the homes and buildings in Chorazin and Capernaum were primarily constructed of local basalt (black volcanic) stone. Some of these basalt homes are in the insula style, where several residences are built around a central courtyard. Often these homes were shared by extended families. 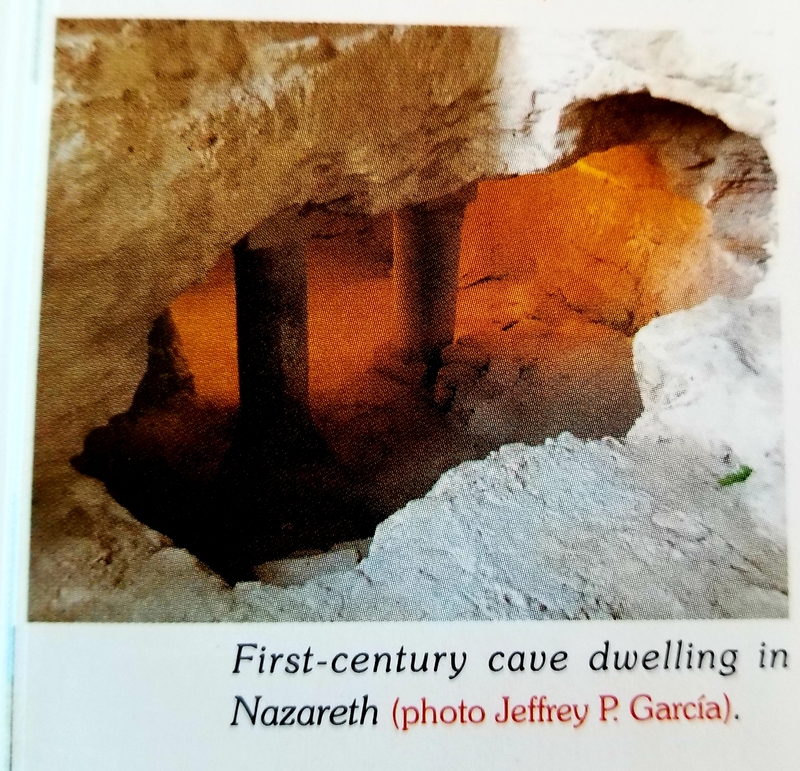 In Bethlehem and Nazareth, it is clear that homes were completely, or in part, constructed out of interconnected cave systems. 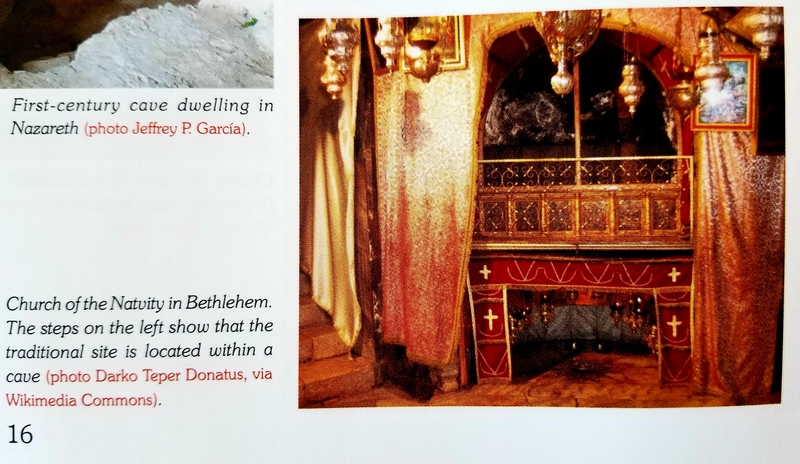 Specifically, for Bethlehem, despite the centuries of ornate decorations in the Church of Nativity, pilgrims visiting the traditional location of Jesus’ birth still get a sense that they are walking down into a cave. 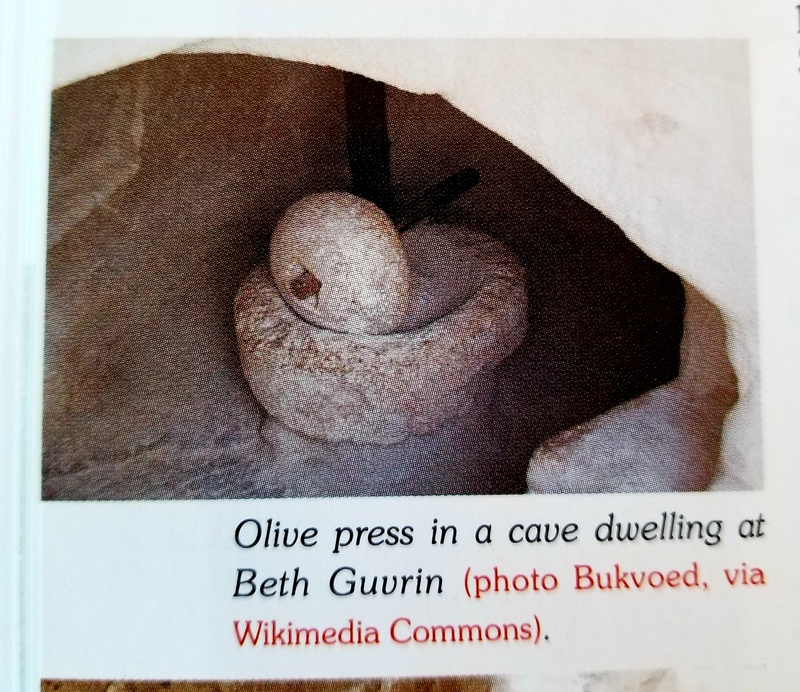 The same types of homes can be seen, without the church tapestries, under the Church of the Annunciation in Nazareth, as well as in the limestone cave systems at Beth Guvrin/Maresha. These homes were often divided between the hearth or clay oven and livestock on one level—the family’s livestock would provide warmth during the cooler rainy season—and the family’s bedrooms on the upper levels (in the summer families would sometimes sleep on the roofs of the homes). Awareness of how Jewish communities lived in antiquity helps one to re-address Jesus’ birth story. Again, traditionally, he was born alone, humble, isolated from the rest of Bethlehem—his own people. Jesus, Mary, and Joseph are displaced to a barn because the “inn,” where payment may have secured a place to stay, had no vacancies. The problem here is that “inn” is not a proper translation of the Greek word katalumati (καταλύματι). Stephen Carlson has already correctly argued that the Greek should be translated, “place to stay.” Furthermore, Luke suggests that Joseph needs to return to his ancestral home and is already there when Mary goes into labor. Certainly, Joseph’s return to Bethlehem in light of the census implies that he would have his family’s home to stay. Thus, it is unlikely that they were in need of another place, or inn, especially if Joseph’s family received word that he was returning with his betrothed. Indeed, it would have been normal for Joseph’s family to have prepared a marital place for Mary, Joseph, and child—one that was an addition to the home. Middle Eastern customs, up to the modern day, indicate that when a son marries, additions would be made to the house in order to accommodate the growing family. This addition could easily be referred to in Greek as a κατάλυμα (kataluma; i.e., “lodging/place to stay,” traditionally translated as “inn”). For whatever reason, when the time came for Mary to give birth there was no space in that part of the house. As a result, it was necessary to move to the larger part of the home, the area in the cave where the family’s oven would be, but also where the family would have kept some of their livestock. What separated the animals from the rest of this room were mangers. Therefore, rather than being abandoned to an isolated barn, born among animals with no one but Mary and Joseph, Jesus is born with Joseph’s family, not apart from them. While this is not explicitly stated in Luke, the reader must remember that the Gospels, in general, assume that their respective audiences have some familiarity with life in the first century. Taking into account the cultural and linguistic setting of the time, refreshes the traditional reading of the Nativity story. How interesting! Thinking about Jesus being born in his grandparents’ home does change the tone of the story a bit – it makes it cozier. It helps us remember that when God sent His son to earth, he placed him in a family that would raise, support, and teach him; it reminds us that family and relationships are important to God and that Jesus made his entrance on earth with family right at the center of the story. 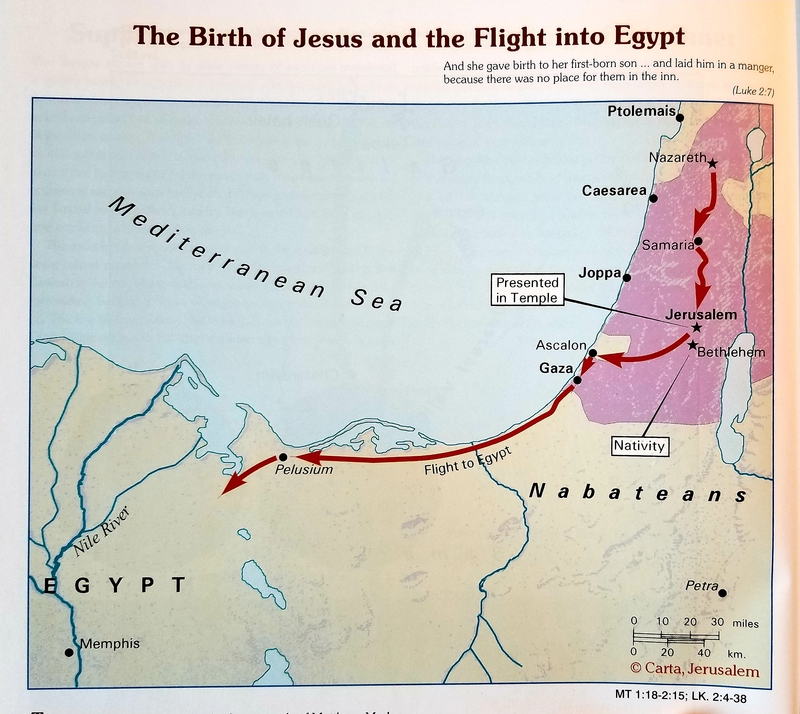 Which Route Did Mary, Joseph, and Jesus Take When They Went to Egypt? According to Christian tradition, Jesus was born at Bethlehem in the days of King Herod (who died in the spring of 4 B.C. ); Jesus’ birth probably occurred in December, 5 B.C. According to Luke (2:22–24), the child was presented at the Temple. Menaced by Herod, Joseph and Mary decided to flee to Egypt by night. The shortest way to leave Herod’s domain was seemingly by way of Ascalon, which lay on the main route to Egypt; the safer way of the desert would have been too arduous for a woman and a newborn babe. The family arrived unharmed in the land of the Nile, where they found shelter and sustenance among the many Jews then living in Egypt. How Did Mary, Joseph, and Jesus Return from Egypt? After the death of Herod, Joseph had a vision in which he was warned not to return to the environs of Jerusalem. Archelaus, the son of Herod, now ruled in Judea; and he exceeded his father’s tyranny. Instead. Joseph settled in Nazareth, a small Jewish village about seven miles southeast of Sepphoris, the capital of western Galilee. Scant attention is given to Joseph’s likely geopolitical reason for choosing Nazareth. The remote village lay in territory under the milder rule of Herod Antipas and beyond the murderous reach of Archelaus. The traditional route of return along the coast takes little account of the warning to avoid the territory of Archelaus. While Matthew does not specify, Joseph may have circumvented these districts and followed the well-known southern route from Rhinocorura at the Brook of Egypt towards Petra. 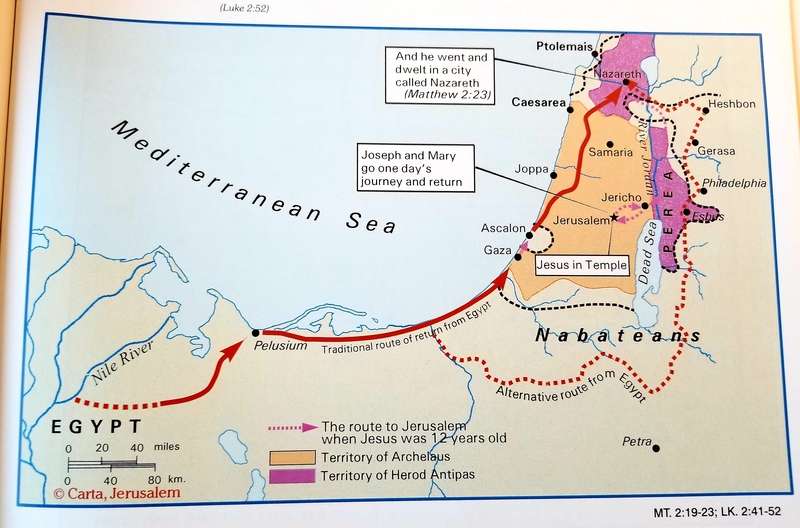 Their journey north beyond the Jordan would then have passed through Perea and approached Nazareth in Galilee from the southeast. Commentary from The Complete Jewish Study Bible! 1:1 This is the genealogy of Yeshua the Messiah, son of David, son of Avraham. Matthew opens with a genealogy, because in the first-century Jewish world, descent is often more important than character. Furthermore, the phrase “This is the genealogy” reflects the Hebrew phrase eleh toldot, which appears ten times in Genesis, framing the story of Messiah Yeshua as a reflection and continuation of the narratives of the Torah. This genealogy confirms that Yeshua meets all the requirements of the Tanakh for the Messiah: a descendant of Avraham (Abraham; Gen. 22:18), Ya’akov (Jacob; Num. 24:17), Y’hudah (Judah; Gen. 49:10), Yishai (Jesse; Isa. 11:1), David (2 Sam. 7:13) and Z’rubavel (Zerubbabel; Hag. 2:22–23). Yeshua is Jesus’ name in Hebrew and Aramaic, which are the languages he spoke. The word Iesous represents the ancient Greek speakers’ attempt at pronouncing “Yeshua.” The Greek word for “Messiah” is Christos, with the Hebrew Mashiach, meaning “anointed” or “poured on.” More than three hundred eighty times in the B’rit Hadashah, “Messiah” appears as a reminder that he is revealed as the promised Messiah for whom the Jewish people have yearned. …and Y’hudah was the father of Peretz and Zerach (their mother was Tamar), Peretz was the father of Hetzron, Hetzron was the father of Ram…Salmon was the father of Bo’az (his mother was Rachav), Bo’az was the father of ‘Oved (his mother was Rut), ‘Oved was the father of Yishai, Yishai was the father of David the king. David was the father of Shlomo (his mother was the wife of Uriyah). 1:3, 5–6 Tamar…Rachav…Rut…(…the wife of Uriyah). God includes these four Gentile women (Tamar, Rahab, Ruth, and Bathsheba) in the ancestry of Yeshua the Messiah, through whom Gentiles, women, and slaves are saved equally with Jews, men, and the free (Gal. 3:28). Jewish tradition teaches that they were converts to Judaism. Rut certainly was a convert, and tradition holds that Rachav and Tamar were converts as well. Thus there were fourteen generations from Avraham to David, fourteen generations from David to the Babylonian Exile, and fourteen generations from the Babylonian Exile to the Messiah. 1:17 Thus there were fourteen generations. Matthew’s genealogy emphasizes the number fourteen, the numerical equivalent of the name “David” in Hebrew. Likewise, the account of Yeshua’s naming as an infant implies knowledge of Hebrew: “You are to name him Yeshua, [which means ‘Adonai saves,’] because he will save his people from their sins” (v. 21). Despite the prophetic nature of Matthew 2, certain Jewish scholars incorrectly conclude that this is the first anti-Semitic assertion of the New Testament, where God chose the Magi (presumably Gentiles) over his covenant people (Isra’el) in presenting the Jewish Messiah (v. 7). Jewish scholar Amy-Jill Levine points out, “Matthew’s second chapter has been read as a foreshadow of the passion, in which evil Jews persecute the righteous while good Gentiles seek their well-being” (Farmer 27–28). Historically, Christian theologians have mistakenly insisted that “the term ‘magi’ was used as the name for priests and wise-men among the Medeo-Persians and Babylonians. These persons were supposed to be adept in that secret learning which in remote antiquity had its seat in Egypt, and later in Chaldea, from which latter fact they were often called Chaldeans” (Kasdan, Matthew Presents Yeshua 107). Most Christian scholarship thus argues that the Magi were Gentiles and of pagan origin. However, recent biblical scholarship and archeological evidence has proven that the Magi were neither Gentiles nor astrologers (stargazers), but in fact were Jewish sages. As noted by Kasdan, “Babylon was still the place of residence for the majority of the Jewish community even as Matthew was writing in the first century” (107). Of the origin of these Magi, scholars agree they are linked to the prophet Dani’el, near 500 b.c.e., who in the Diaspora waited for the time of return and the restoration of Isra’el. Some have even speculated that these wise men came from a Jewish school that went back to Dani’el’s day, where the prophets looked to the heavens for the promised arrival of the Messiah. The star in the east was in fact a manifestation of Adoni’s Sh’khinah (Divine Presence), marking the arrival of the Son of Man. The Jewish Midrash Aggadat Mashiach (Bet ha-Midrasch 3:141–43) remarks, “This is the star of the Messiah, and it will abide in the east fifteen days, and if it tarries longer, it will be of the good of Isra’el.” As to the accusation that God providing revelation to the Magi is anti-Semitic, this is refuted in that the wise men of the east were in fact Jewish sages awaiting the arrival of Isra’el’s Messiah. WHY WAS BABY JESUS TAKEN TO THE TEMPLE TO BE DEDICATED? 33 Yeshua’s father and mother were marvelling at the things Shim‘on was saying about him. In the book of Exodus, the tenth plague brought death to all firstborn in Egypt, but the Israelites were spared because they followed God’s dictates. As a result, God declared that all the Jewish firstborn sons (and animals) belonged to him. Those sons, having been saved by God’s hand, were now obligated to be his full-time servants and priests. Several years after the Israelites’ departure from Egypt, these firstborn sons became the priesthood of the Jewish nation. However, as God revealed more of his plan for his people, he designated an entire tribe of Isra’el for this holy purpose: the sons of Levi (see Num. 8:14–18). This presented a problem regarding what to do with the previously appointed firstborn sons. The answer is found in Torah, in which God specified that the firstborn sons be redeemed (bought back) for service other than the full-time priesthood. Since the days of Moshe (Moses), the custom of pidyon ha’Ben has been an important event in the biblical/Jewish life cycle. As mentioned in Numbers 18:16, the timing of pidyon ha’Ben is one month after a boy’s birth. In biblical times, this would require the father to take his infant son into the Tabernacle or Temple, where he would offer an official remittance of money for the baby boy’s redemption. The exact amount is stated: five shekels of silver. Following the Torah, Yosef and Miryam (Joseph and Mary) brought their newborn baby boy to the Temple to fulfill their obligations. This obligation was twofold: first, to ceremonially cleanse the mother and make the proper sacrifices (Lev. 12:1–8). The family of Yeshua was not wealthy and therefore presented the less expensive offering of pigeons. The second part of the obligation was to redeem the firstborn son through the pidyon ha’Ben ritual. The child Yeshua was not exempt from this redemption. We hope you have enjoyed these excerpts and that your understanding of the Christmas story has been enriched. Have a very Merry Christmas from all of us at Hendrickson Publishers! For more information about any of the aforemention titles, visit our website! Edersheim, Alfred. Sketches of Jewish Social Life. Peabody, Mass: Hendrickson, 1998. Avi-Yonah, Michael, and R. Steven Notley. Understanding the Life of Jesus: An Introductory Atlas. Jerusalem, Israel: Carta Jerusalem, 2015. García, Jeffrey P. Understanding the Gospels as Ancient Jewish Literature. Jerusalem, Israel: Carta Jerusalem, 2018. Stern, David H., and Rubin, Barry COMPLETE JEWISH STUDY BIBLE: Illuminating the Jewishness of God’s Word. Peabody, Mass: Hendrickson, 2016.